Like the rest of us, you most likely have made a promise to yourself that you were going to start exercising tomorrow…yet tomorrow comes and goes and you are still sitting motionless on the couch. So, what’ going on? Why do we continue to buy into our excuses? Excuses that do nothing but hold us back and keep us from our vision? Let’s examine some of the excuses you have heard many times from others as well as yourself. No time…probably the most convenient and overused excuse we buy into. Funny thing is, your health and well-being need to be priority because without them there is no you. You can make time for anything you really want in life (think of people much busier than yourself). So, first things first…let go of your excuses and focus on health. Too busy…related to “no time”? Too hot, too cold…just don’t want to…which one are you entertaining today? Which ones are you allowing to “rationalize” away your dream of being fit and healthy? I am so out of shape I don’t know where to begin! There is no such thing as instant fitness for anyone and everyone has to start somewhere…so it might as well be now. You’ll be leaner, stronger and more energetic. Perceptions are real killers when it comes to being fit and healthy and unfortunately many people believe things they have heard in the ancient past like “it takes too long because you have to go the long endurance route” which then opens the door to giving into an “excuse” like “I don’t have time”. But as all things evolve so too does our knowledge of staying healthy and the new way is to work the muscular system is a short time frame of around 30-40 minutes with effort put into it. All it takes is one or two of these work-outs each week to makeup for hours of low intensity fluff that will never get you in better shape…although that’s what you previously believed. Hold on to the fact that squeezing in a couple of hours a week for your strength training program is something that will make virtually every other aspect of your life better. Many people harbor negative feelings about physical activity…easily heard by the use of words like “should”, “hate” and “make myself”. These thoughts and feelings stem from negative past experiences such as school sports, boring exercise routines and discomfort from doing too much too fast. Start shifting your focus/attention to how wonderful you feel when you work out and eat healthy rather than focusing on negative things like how much weight you should lose, those programmed thoughts that are keeping you focused on the negative rather than seeing the positive. Your goal should be to develop and exercise as many positive statements about being active you can think of and repeat them often to yourself. For example, rather than say “exercise is boring” say…”being active gives me the opportunity to relive stress and feel better about myself”. Do you see how you have shifted your attention/focus and awareness onto the positive? Work on creating higher motivational levels at the same time you are improving your exercise and eating habits. The only difference between people who do reach their goals and those that do not is the willingness to do what is necessary to make it happen. Be willing to make a plan and stick to it, be willing to make promises to yourself and stick to them, be willing to get off that couch and get going and be willing to get yourself back in the kitchen cooking from scratch and most of all, be willing to get started right now, today…to change your habits so they include exercise and healthy eating. 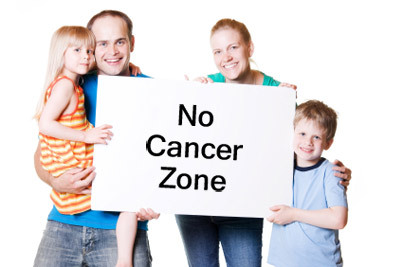 Cancer is a merciless killer that in most cases can be avoided through lifestyle changes that only you can control…but you are not in this alone and you can get help with “Just Say No To Cancer”…don’t allow this dreaded disease to steal anymore life from you or your loved ones.